Barrow (NY 704494) 2 miles NNW of Alston. Finds in Museum of Antiquities, Newcastle. "This mound is 22ft. in diam. and about 3ft high. It has been built upon a natural knoll which makes the barrow look larger than it is. Excavation showed that the mound has an earthy core with a rubble capping. 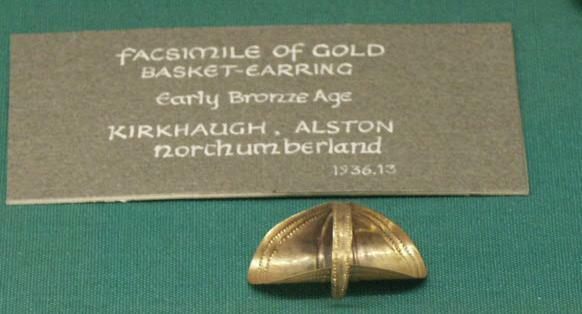 Decayed traces of an unburnt body were found at the centre and amoung the offerings in the mound near the burial there was a basket-shaped gold ear-ring of a type found with beakers in Britain. Date, c. 2,000 - 1,700 BC.